County Dublin VEC have submitted a planning application (Ref: FW09A/0032) for the long awaited permanent national school, secondary school and community centre buildings. These buildings of course were promised at the last elections and this planning application comes just two months before the upcoming local elections. 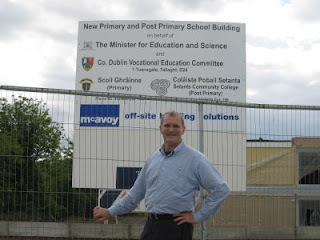 • The development on 8 acres will consist of a three storey post primary school and community centre consisting of 27 classrooms, 38 specialist classrooms, PE facilities, a special needs unit and ancillary accommodation. It will accommodate 1,000 pupils. • There is a separate three storey primary school consisting of 24 classrooms with a special needs unit. • 115 no. parking spaces including universal access car parking, 9 enclosed 510 sq.m ballcourts and 1. enclosed 2705 sq.m artificial football pitch with floodlighting. • The application also provides for dismantling the recently built 2 storey temporary prefabricated school. You can view the plans and drawings on April 1st upstairs in the Paddocks from 8pm to 10pm.